Whenever I post a SUQQU color post, I often get asked what I specifically recommend of all the pieces. Not sure how I am so fortunate, but SUQQU has been very generous in providing samples that I often don’t get to exercise my own consumer wallet muscles. It’s hard to retroactively say what I would have bought but this time I had a chance to flex. It was very limited in quantity everywhere, so I had to fill out their advance order form to reserve some items. I really wanted to order everything. I really did. But I am at maximum makeup storage capacity these days and even exquisitely beautiful these haven’t gotten used regularly. A Belly can only bear the crushing guilt of all those palettes staring at her without cracking. For the palettes, it was a matter of going pink or going orange. The pink palette is stunning, but that super saturated pink looked a little challenging. And then the orange was calling me because I’m large intimidating my orange makeup, especially on the eyes. So what the hell. Basically, that was my thought process. 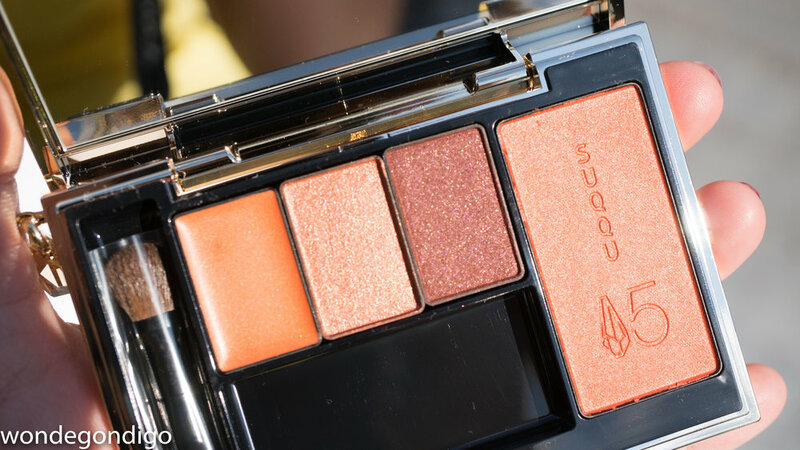 Here’s the 15th Anniversary Color Compact in 101 Shakunetsushu, Passionate Tangerine. Despite the vibrancy of the orange tones, it swatches and applies very softly. From left to right: cream eye shadow shade, middle eye shadow shade, right eye shadow shade and blush. And those darn widdle lipsticks. They are miniature lipsticks (did I mention dangly crystals?!). There are five shades and I purchased two: 102 Rengatou, Coffee Orange and 105 Sumiichigo, Deep Berry. The brand calls them semi matte, but to me they are more a traditional satin finish, in very wearable shades. It’s not uber pigmented, but very comfortable on the lips. They feel like the Moisture Glow lipstick formula, which I really enjoy.